June 20-24 was a busy week for us. Orion is 11 months old here. The workshop was awesome! Dr. Linda Mamer from British Columbia presented on "Communication Development and Instructional Strategies for Students with Deaf-blindness and/or Severe Disabilities". Enlightening, informative, empowering. I enjoyed the simulations, and examples of sensory perspectives (on DVD), demonstrations. My mind was tired from all the useful information but was happy at the same time. I highly recommend ALL teachers take this workshop. Even for teachers who do not plan on working with deafblind and/or severely disabled children. This would be a great workshop for teachers of the Deaf so they're aware of the vision challenges a Deaf child may have even if he/she is not legally blind. The same goes for teachers of the visually impaired, to be aware of hearing issues and misconceptions. As a parent, I enjoyed learning more about approaches for Orion and the diverse children this workshop covered. What Thomas and I have been calling signs when communicating with Orion, we learned they're called touch cues. Pretty much what you first start using from scratch with a deafblind child. Thomas and I already knew about tactile signs since we've met Deafblind adults but we've always been wondering how does a Deafblind baby like our Orion get from where he is to a tactile-signing Deafblind adult. Through Linda's workshop, we saw the connection. We saw that we did the right thing starting with touch cues (Orion's first sign/cue was 'milk' at mere hours old!) and using it with object cues (what we've been calling symbols). "Milk" was presented with a bottle of milk. Orion's frequent object cues are his spoon, diaper (new ones every time, of course! 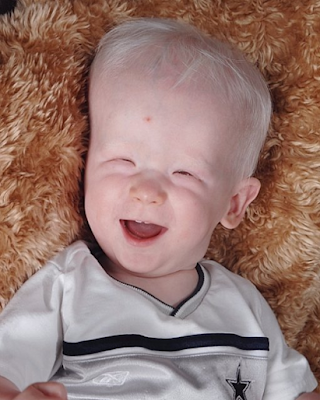 ), wipes, bottle of milk. I'm sure there's more objects he recognizes that we don't realize we use consistently with him. Now we need to start adding in more cues that represent things he does everyday anyway. These object cues need to be real. No miniatures, no plastic. My idea for "drive" or "car": we need to get a short length of seatbelt or car seat strap or the release button from an old carseat to present to Orion before we put him in his carseat. No little cars. Another approach I love and was discussed at the workshop is using hand under hand. Orion at nearly 1 year old is at the threshold, not yet crossed, of holding onto my hand when I sign normally from myself and not onto his body. I've been touching my thumb on his chin, knowing he only felt the thumb, not the rest of my open hand for "Mom". (We've wondered just when does a Deafblind child know to put his hands over the signer's hand.) I'm trying to transition to signing "Mom" on my own chin, sometimes Orion would hold onto my pinkie finger when I do. He laughs when I sign slowly only to sign it fast, changing speeds. Linda explained that eventually Orion will feel all of my hand and then my face where my thumb connects to the chin. Hand over hand is not only for using tactile signs but for showing the child his/her environment. Thank you, CBSS, for bringing Linda to Maryland! Also, I agree the interpreters were awesome. So much information went through them at a high rate! During that week, we were so fortunate to have our niece Jodi join us at U of MD to watch/play with Orion at CBSS. He did really well. I loved having him with us for lunch. Skyler and Tasia went to a "Holiday Hoopla" camp at the closest YMCA to us. Overall, they had fun. There were field trips nearly every day that week. It was "interesting" for Skyler because he did not have an interpreter for the first 2 days even though I provided contact information for 2 different interpreting agencies. "He's having fun [so everything must be fine]." Frown. This was also told to a teacher of Orion's who called on our behalf to inquire about the interpreter. To help the camp director understand the perspective, we asked her to imagine the camp counselors of Skyler's group to not use their voice and communicate with all the campers through gestures and visual aids. Would she accept that? (She was so nice but she had NO idea what this does to a deaf child.) Finally some interpreters were scraped together to give Skyler access to the content discussed with the group. Skyler had a 'favorite' interpreter who also wrote us a note on the last day. It turned out she had a master's degree in Deaf education and has worked with deafblind children at a school for the blind. Yet another person with a connection to deafblind children for us to know. Nice! 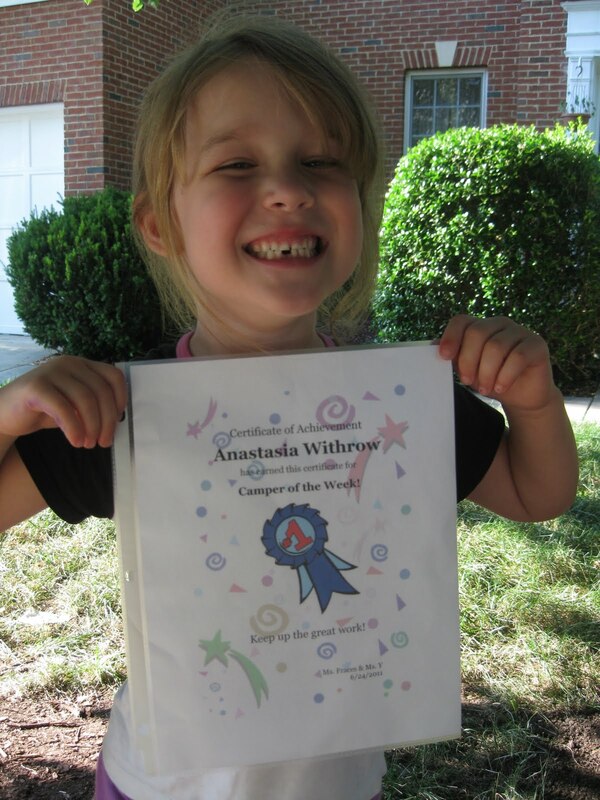 Tasia got a certificate "Camper of the Week" from the Holiday Hoopla group.